Sometimes you don't need a lot of ingredients to make excellent food. The above dish has literally has eight ingredients. And that includes water, salt, and pepper. In addition to only the bare essentials, you also barely need any time to make it. I had everything ready to go well before the pasta was done. Preheat broiler. Bring enough salted water to cook the rigatoni to a boil. Add pasta. While pasta is cooking, chop walnuts, and combine with ricotta and parmesan, and salt and pepper to taste. Set this aside. In a flameproof pan, place endive (lightly coated in olive oil and a pinch of salt) under the broiler until tender, but do not burn. Don't go too far from the broiler and keep and eye on it! Stir one ladleful of pasta water into the ricotta and stir to combine. 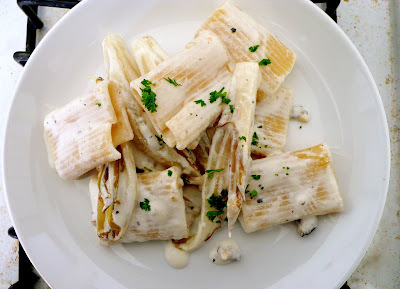 Drain cooked pasta and mix with walnut ricotta mixture and endive. Serve warm. I *honestly* almost said endive... I got cut off by another conversation!